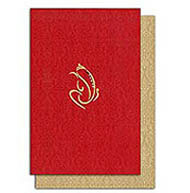 Description: An elegant looking soft bound card has a red cloth wrapped over it with maroon design background. The centre has a gold foiled Ganesha with bindis pasted over it. Inserts are made of gold metallic card with a design background and matching envelopes.